What a difference one year can make. In 2015, Darnell Waller, aka HollywoodSleep ended his EVO journey in 3rd Place. For most people, this would be all the validation you need to be considered one of the best. But not Sleep. Fast forward to a few weeks ago, and well, you already know the outcome. 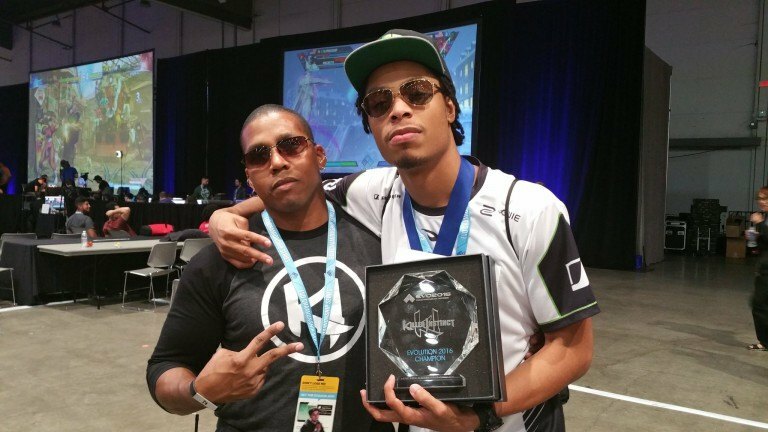 Sleep claimed his title of EVO Champion in Killer Instinct! We caught up with Sleep to see how his EVO experience has been for him and more importantly, what’s to come! Colt Yohman – Is KI your first Competitive fighting game? Darnell Waller – No, Marvel vs Capcom 3 was the very first competitive fighting game for me. CY – What do you enjoy about competing in KI? DW – Probably the competitor aspect of it. Also love the crowd when I’m on the stage competing. The crowd rooting for, or against me to win, that feeling is amazing! CY – You been known for playing Glacius in Season 1, then Kan-Ra/Aria in Season 2, and now Arbiter/Gargos in Season 3. All these characters have wildly differently play styles from one another. What is it about each of these characters that drew you to them or what has been the common attraction you found between all of them? DW – Well this is an easy question. I’m attracted to characters that play keep away, or that can trap you, and put you in blender. I’m all about consistent setups most zoners normally have this in common. Now Gargos is something else.. He’s just EXTREMELY FUN! CY – Finishing 3rd at EVO 2015. While being an accomplishment, must have been slightly disappointing in that you were so close to coming in 1st place. What was your mentality after that event and as you moved forward in playing Killer Instinct? DW – My whole mentality changed after EVO, but for greater good of course. After getting picked up my F3 “Flipside Tactics” in August of 2015 I had a different approach on the FGC, and life. These guy help me improve my game far beyond of what I thought could do. These guys invested in me so, I had to dish out my part of deal, which was win EVO. Now it’s time to win Killer Instinct World Cup in March. Shout out to Brandon Alexander for his hard work on putting that together also. CY – And finally we are back at EVO 2016, only a few weeks ago now. Walk us through what that weekend was like for you? Nervous? Excited? You played mostly Arbiter and Gargos, why those characters and not others you used in the past? And to answer the last question I used Arbiter mainly throughout the tournament because I was more comfortable with maining him because I knew he could take me there. CY – Also, you seemed really successful with Gargos the times that you used him in the Top 8. Why not play him more often than you did? DW – Well Gargos is a fun character but not really a great character on paper. The only reason why I picked him versus UA|Bass. Hmm I just knew it would be a easy win! And that’s simply because I knew Bass didn’t know the match up completely. CY – 1st Place at EVO. That’s quite an accomplishment! What’s next for you with Killer Instinct? DW – My next big goal is winning KIWC “Killer Instinct World Cup in March of 2017!! DW – Big shout out to Christian Finch GT: FinchOMatic without this man I probably wouldn’t be talking to you today. Next person would be F3 Flipside Tactics!! Amazing organization that believed in me and continues to support me in my career. Shout out to Michigan/Midwest I did it for you guys now its time for yaw to help me keep the ring in Michigan!! !